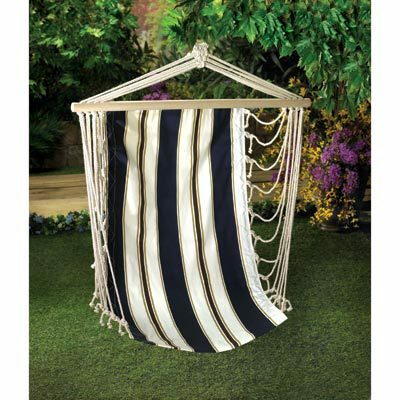 NAVY STRIPED HANGING CHAIR home decor, jewelry, decor, decorations, electronics, fountains, floor mats, art glass, vases, garden essentials, fireplace screens. Nautical navy stripes will cradle you in cotton comfort. Whether you’re relaxing after mowing the lawn or completing a yacht race, swinging yourself to serenity is a breeze. Weight: 2.4 lbs 35½" x 25" x 49" high. Cotton.